In October 1918, Elizabeth B. Henderson Cotten became chairwoman of the Salisbury American Red Cross (A.R.C.) chapter’s Influenza Emergency Committee in Rowan County, N.C. She would create an important report documenting the whole of the efforts of the Salisbury and other Rowan County Red Cross chapters in providing services for those affected by the virulent Spanish influenza pandemic that broke out all over North Carolina in the spring of 1918. 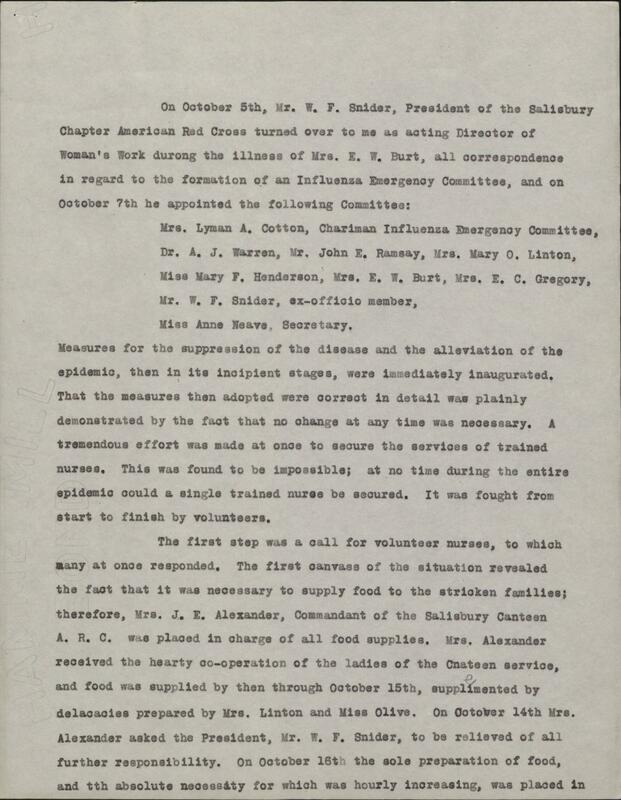 She compiled a 21-page report, listing the names of all of the women and men who served in the county as Red Cross volunteer nurses for those suffering from the flu, those who made face masks, operated a Diet Kitchen to make food for the sick, raised or donated funds to support the relief work for the flu, delivered food as part of the Red Cross Motor Corps, or donated food to the Red Cross chapters for meals for the sick. 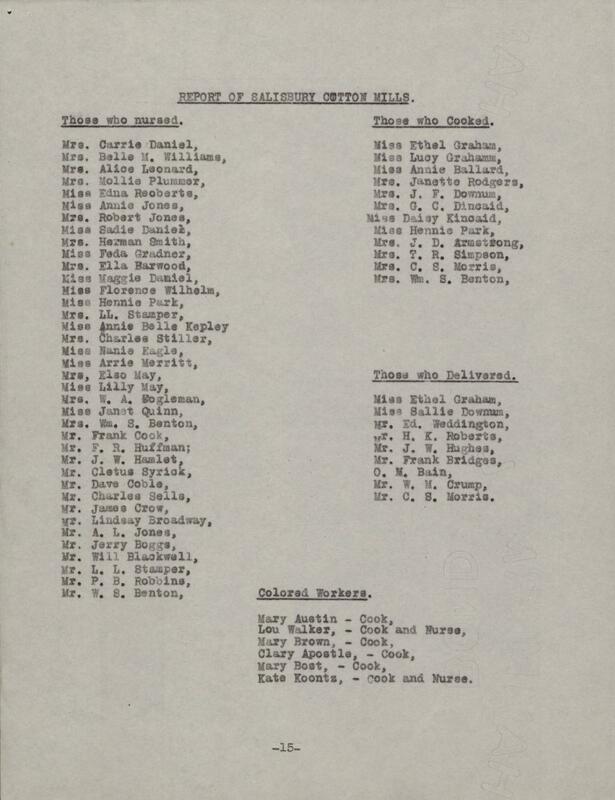 The report also lists names of those who worked with the Red Cross as nurses or food delivery people at various Rowan County and adjacent communities’ businesses and schools, such as the Salisbury Cotton Mills, Erwin Cotton Mills of Cooleemee (N.C.), Salisbury Normal & Industrial Institute. There are also the names of those who volunteered with the East Spencer (N.C.) American Red Cross chapter during the outbreak. Rowan County appears to have had one of the more organized influenza response committees in North Carolina for Red Cross chapters—particularly in Salisbury. 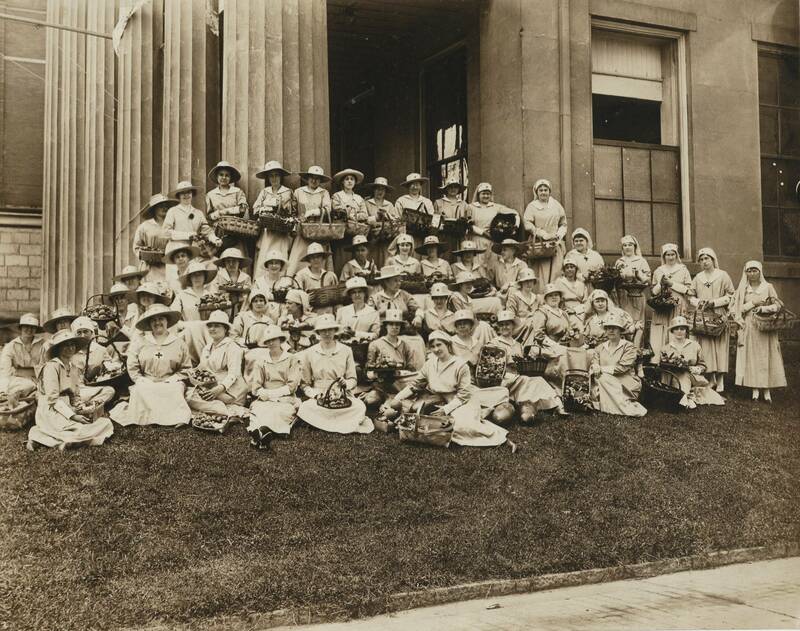 However, documentation of the efforts of North Carolina Red Cross chapters during this outbreak is scarce, as many of the people keeping records to be compiled into later histories were killed by the Spanish flu. We are fortunate to have the original report that was provided to the North Carolina Historical Commission between 1920 and 1924 by the Salisbury A.R.C. You can read the original report on how the Rowan County A.R.C. chapters responded to the Spanish flu, and see the names of those who sacrificed for the care of their fellow neighbors in the online WWI collection in the North Carolina Digital Collections (NCDC), a joint effort of the State Library of North Carolina and the State Archives of North Carolina.